Día de los Muertos, which is coming up Nov. 2, always triggers childhood memories of visiting the cemetery with my mom. As is customary in Spain, we would bring fresh flowers to my grandpa’s niche and pay respect with a moment of silence. 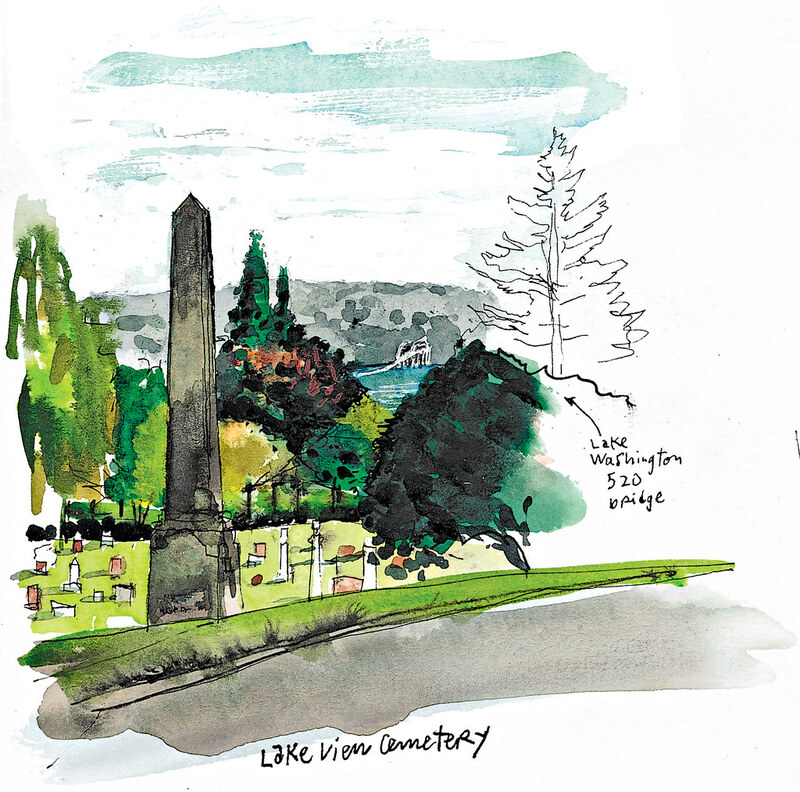 Though I am thousands of miles away now, I decided to observe the day, if only a bit earlier, with a visit to the city’s oldest cemetery, Lake View, on Capitol Hill. Cemetery manager George Nemeth said more than 40,000 people have been buried here since 1872, and they bury an average of 120 more every year. Imagine how many people have a special connection with this hilltop and its magnificent views east and west. People also visit for the history lesson, as many of Seattle’s pioneers are buried here. 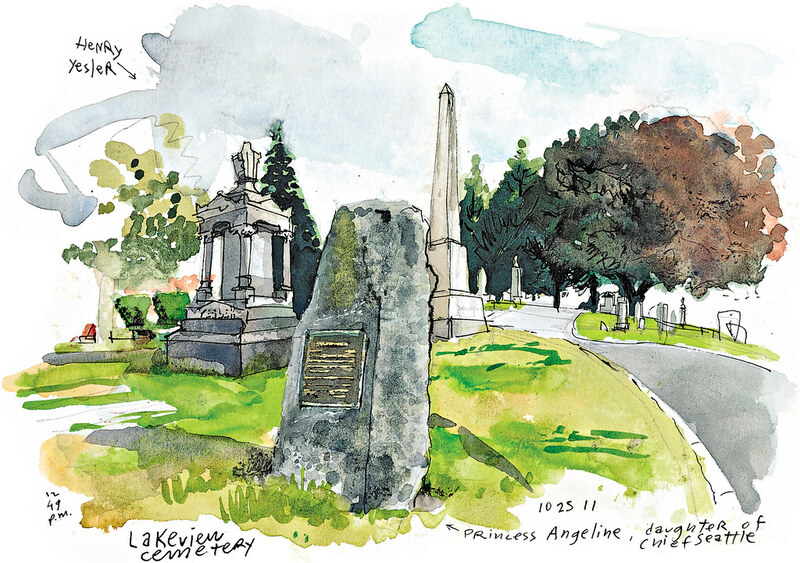 Of all the famous graves to sketch, I was drawn to Princess Angeline’s simple granite rock. The daughter of Chief Seattle, I learned, requested to be buried next to her good friend, Henry Yesler. The cemetery offers great views of the city and beyond. After the morning clouds lifted, I sketched this vista that includes the 520 bridge spanning Lake Washington. On clear days, Nemeth said you can even see Mount Baker to the north. 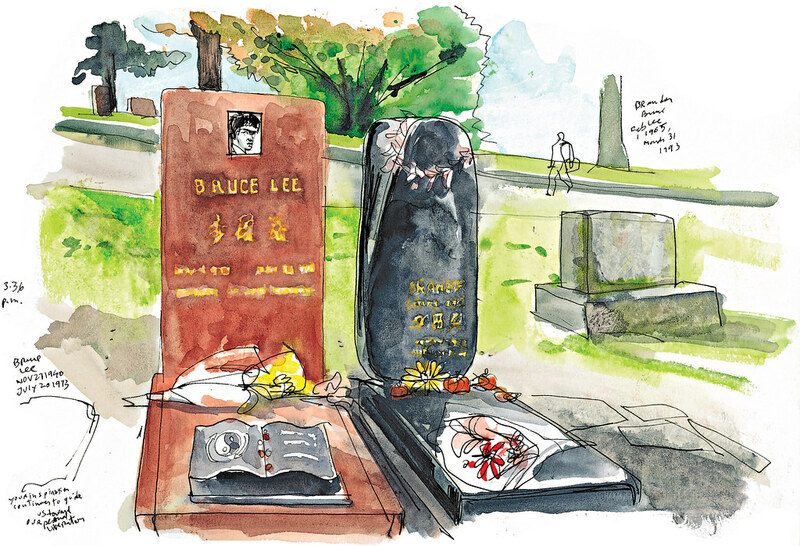 As I was finishing my sketch, Yoshihiro Deguchi (right), a visitor from Tokyo, stopped by to pay his respects to the Lees. Deguchi, 26, said he and his father have been big fans of Lee for years but didn’t know he was buried in Seattle. He found out just three weeks ago while reading a travel book in preparation for his first trip to the United States.